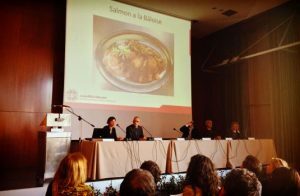 Share the post "Les Roches culinary instructo speaks at the conference “A Dish for the Duke” on medieval culinary traditions in Milan"
Les Roches culinary instructor Mr. Friedrich Stegmueller speaks at the conference “A Dish for the Duke” on medieval culinary traditions in Milan. Mrs Francesca Bonzo, LHE Italian representative, and Mr Friedrich Stegmueller, chef and Kitchen Instructor Supervisor at Les Roches Switzerland, spoke at the congress “Un piatto per il Duca”, organized in Milan on October 16th by “Castelli del Ducato” about medieval culinary traditions. During the day of “Un Piatto per il Duca”, literally “A Dish for the Duke”, Mr Stegmueller and Mrs Bonzo presented the recipe “Salmon a la Baloise”, a medieval recipe which can still be appreciated nowadays. To the welcoming Italian public, Mrs Bonzo also presented the hospitality and culinary programs offered by LHE in Switzerland and many other locations in the world. (see photo “Presentazione ricetta LHE” – see Flyer LHE recipe). Dino Betti van der Noot, from Accademia Italiana della cucina, spoke about the first Italian chef Maestro Martino, born in Switzerland and chef in Milan in XVI century. Mirella Motta, from Castelli del Ducato, referred to recent studies of Milan University on the banquets organized during the Duchy of Milan. Paolo Salvadory of the Principato di Lucedio Abbey, where rice was first cultivated in Italy in XIV century and is still cultivated; spoke about rice in the Lombard tradition. The congress ended with the prize awarded by Castelli del Ducato to the hospitality high schools of Lombardia and Piemonte regions, who participated in the competition regarding medieval culinary traditions “Un piatto per il Duca”. The students had been asked to produce a menu that could have been served at the court of the Duchy of Milan, and a short study about the historical value of the Duchy of Milan. They chose some very creative recipes such as: boar with apples, duck stuffed with sausage and dried fruits accompanied by polenta made with spelt , and eel grilled with onion puree. 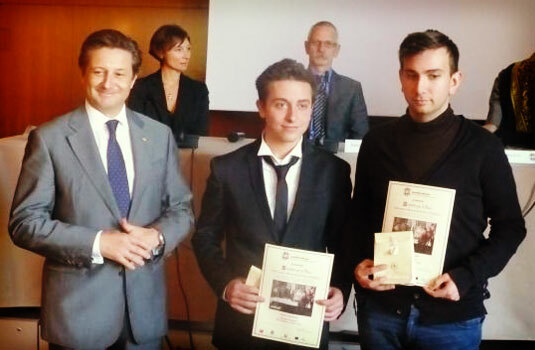 The schools “Istituto De Filippi” in Varese and “Istituto De Filippi” in Arona received a prize.